Into the Abyss - "Cosmogonia"
Where the hell have these folks been hiding? Luckily, Mick Magic put a track ("The Eternal Heat") from Into the Abyss' second album on his 2-cassette Music & Elsewhere compilation, and it just blew me away! Dark, ambient, gothic, totally mesmerizing! So in no time flat, I was ordering their newest CD, "Cosmogonia." This quintet from Frankfurt, Germany just has to find a greater audience...they're too good not to notice. Recent tours have found them playing with Bevis Frond and Embryo, so no doubt they're finding new fans. From what I've read, "The Feathered Snake" album explored Aztec themes, whereas "Cosmogonia" seems to be built upon an Egyptian ethic. The instrumental prelude "Anshar" leads straight into "Alexandria," which is simply too cool to easily describe. It's obvious they're not talking about Alexandria, Virginia anyway. Greek native and Into The Abyss founder Janis Kalifatidis is a commanding presence as lead vocalist, delivering his lyrics rich in mythical imagery in dramatic fashion - "White marbled City breathes in the sunlight, washed by the mouth of the East. The clash of Empires rings 'round about her, and History lingers about crowded Ptolemaic streets." Marion Maul's flute playing on "First Rebellion" adds a nice touch to the already-thick orchestration. Man this stuff is good. Midway through the album, "Lunar Drive" blasts through with a bouncy riff, helicopter-synths circling overhead, and then we're treated to Susanne Reinhardt's devilish violin...eerie. "The Cyclotron" carries a stadium-sized weight behind it, as if Pink Floyd were performing it to 100,000 strong. "Hermanubis" is also a wonderful tune, all cosmic and airy to start, but then builds higher and higher towards a lofty peak like a Himalayan trek. The beautiful acoustic/ambient piece "Crystal Eclipse" and subsequent 'outro' "Kishar" bring us back down below the clouds so we can ponder the view of the cosmos we've just received. The Legendary Pink Dots produce a quite different style of gothic space rock, with wild effects and oscillators aplenty - some good stuff there. 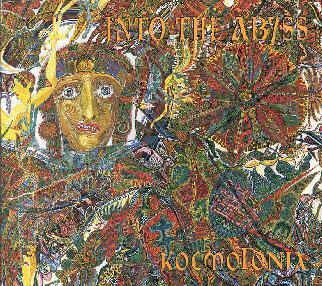 Into The Abyss, though, is now my choice as *the* gothic band for space-heads, and prog-fans too. Kalifatidis' vocal style won't please everyone (occasionally over-the-top), but except for the one or two songs where he simply sings too much, I like his work just fine. And musically-speaking, this band is absolutely top-notch. Fantastic cosmic sound, rich arrangements, progressive writing...it's all here. Check 'em out - you'll be glad ya' did. You can visit Into The Abyss at their web site.